On the eleventh anniversary of Abraham Lincoln’s assassination—April 14, 1876—a monument to the martyred president was dedicated in Lincoln Park, Washington D.C. 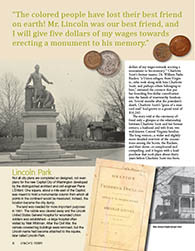 The day was “declared a public holiday,” and “every one was free to participate in the exercises” which included a parade featuring almost “all of the colored organizations in the city.” The monument, known as the Freedman’s Memorial or Emancipation Statue, had been funded exclusively by donations from African Americans. Fredrick Douglass was the keynote speaker. President Grant was given the honor of unveiling the bronze before an estimated crowd of 25,000. TO BUILD A MONUMENT TO HIS MEMORY. Ohio native Marjorie Huiner has lived with her family in Lynchburg since 1975. After her retirement from Centra, she began pursuing two passions: quilting and delving into neighborhood history. Marjorie has been researching the people who lived and worked on the 1,100-acre plantation established by William Scott and his wife, Ann Jones Scott, in 1784. The story spans two centuries and is in progress. This is Huiner’s second contribution to Lynch’s Ferry. Her portrait of the Thurmond and Myers families, “4402 Boonsboro Road,” appeared in the Fall/Winter 2011 issue. 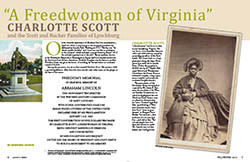 The story of some of Charlotte Scott’s descendants who continued to live on the former Scott plantation will appear in a future issue.